A fast and frantic dice game for two! Roll your dice to match the toppings on your slice and be the first player to complete a pizza pie of six slices. Each player takes five dice. Shuffle the slice cards and deal one card to each player face down. Players count to three and flip their slice cards at the same time. Now roll your dice. 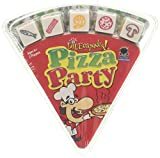 If you roll any dice that match toppings on your slice card then place them on these toppings. Then, quickly re-roll all of the dice that don’t match. Continue this way until you have placed dice on top of all the matching toppings on your slice card. Once you complete a slice card yell “Mama Mia”. Then remove the dice and play again with a new slice card. Keep going until you complete six slice cards. This game is quick to play, easy to set up and fast moving and works well as both a travel game and a party game. This game is for 2 players but expand your game by adding more players with more games. This entry was posted in Discount Childrens Toys and tagged game, Lamond, Party, Paul, Pizza by Childrens Toys and Games. Bookmark the permalink.